CT Realty is now in construction on the development of Westport Logistics Center, a two-building 882.6k sf project in the Fort Worth, TX submarket of Alliance. The project, CT’s fourth major development in the Dallas/Fort Worth Metroplex, was chosen for its prime location next to key logistics and distribution infrastructure. measuring 677.2k sf and 205.1k sf. The buildings offer either single-sided or cross-dock loading with ample loading bays, clear heights of 32 feet or 36 feet, 185-foot truck courts and build-to-suit office spaces. Westport Logistics Center is being marketed by J. Scott Moore and Bob Scully of CBRE. 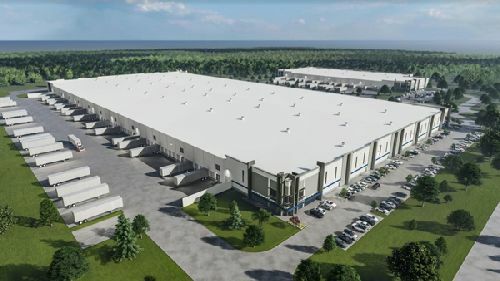 The project, which is being built in a joint venture with Mitsubishi’s Diamond Realty Investments, marks CT’s fourth major industrial development in the DFW Metroplex, where the firm has developed both on its own account and with affiliates over 2 msf of distribution space in the market over the last few years. On a broader national scale, CT has completed or is under construction on another 7.6 msf of logistics centers in Northern California, Atlanta, Illinois, Indianaand New Jersey, and has an additional 20 msf of industrial space in its development pipeline.